Ferries constitute an important component of Vancouver’s transportation system. BC Ferries operates ferry service taking passengers, vehicles and cargo between the mainland and Vancouver Island, the Gulf Islands, the Sunshine Coast, the Queen Charlotte Islands and Prince Rupert. Despite what a lot of people think, there is no ferry terminal in downtown Vancouver. Instead there are two ferry terminals, one at Tsawwassen (pronounced “Ta wa sen”) for passengers who want to go to Victoria, and one at Horseshoe Bay for passengers who want to go to Nanaimo (pronounced “Na ni mo.”). Wilson’s Transportation offers bus service between downtown Vancouver and the Tsawwassen ferry terminal. The service is convenient because it will pick you up in downtown Vancouver, take you to the ferry terminal in Tsawwassen and then drive right onto the ferry. That way you don’t get off of the bus until you are on the ferry. At the conclusion of the 1 hour 35 minute ferry ride, you will reboard the bus and it will drive off the ferry and directly to downtown Victoria. From door to door the trip takes between 3.5 and 4 hours one way. If you are looking for convenience and efficiency for yourself, your family or your group, consider a private transfer. It is often the most economical and definitely the most convenient way to get between downtown Vancouver and the Ferry Terminal in Tsawwassen or Horseshoe Bay. 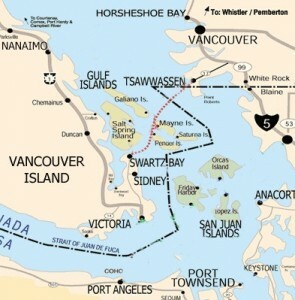 The Tsawwassen ferry terminal is 32 km (20 miles) south of downtown Vancouver off highway 99, and the Horseshoe Bay ferry terminal is 23 km (15 miles) at the west end of West Vancouver off Highway 1. If you take the Tsawwassen ferry to Vancouver Island, you will not arrive in Victoria but in Swartz Bay, about 32 km (20 miles) from downtown Victoria. If you are driving from the Swartz Bay ferry terminal to downtown Victoria, keep in mind that the famous Butchart Gardens is located between the Swartz Bay ferry terminal and Victoria so you might want to visit the Gardens on your way to Victoria. If you want to visit the northern half of Vancouver Island or the beaches on the west coast of the island, then take the Horseshoe Bay ferry to Nanaimo. From Nanaimo, you can access Tofino and Ucluelet on the West Coast or Campbell River and Port Hardy in the northern half of the island. Keep in mind that Vancouver Island is 480 km (286 miles) long and the roads, especially as you go west and farther north, most roads are two lanes and very scenic. If you plan to take your car on the ferry, and if you’re traveling during the summer, the weekend or a holiday, we recommend making a ferry reservation. One way reservations are $15 dollars, but if you’ve ever waited in the ferry line for a sailing or more because of the crowds, you realize that the $15 is well worth it. And speaking of taking your car on the ferry, if you’re going to Victoria for the day, we suggest you leave your car in Vancouver. You can rent a car in Victoria for about $60, less than you’ll pay to take your car over and back. If you’re a walk on passenger you won’t need a reservation. You can consult the BCFerries online for more information about the ferries, for ferry schedules and prices. If you want to go to Victoria but don’t have a way to get to the ferry terminal, see the for more information about bus service that will take you from downtown Vancouver to the ferry terminal and then off the ferry at Swartz Bay and on to downtown Victoria. If you want to travel between downtown Vancouver and downtown Victoria more quickly, consider flying. The 35 minute float plane flight goes from downtown to downtown. Flights are fun, fast and enjoyable. The SeaBus, a double ended catamaran passenger only ferry, crosses the Burrard Inlet between Vancouver and the North Shore. The Seabus makes the 12 minute trip between Vancouver’s Waterfront Station, located just east of Canada Place, and North Vancouver’s Lonsdale Quay. The Seabus runs every 15 minutes during the day and every 30 minutes after 7:00 PM. For more information, call 604-953-3333 or go to the Translink website. You can catch the ferries at English Bay (near the Vancouver Aquatic Centre), the south end of Hornby Street, Granville Island, Vanier Park, Yaletown, Science World and Stamps Landing. Each company takes a slightly different route and has slightly different ports of call, so if you have a destination in mind, ask whether the ferry goes where you want before you buy a ticket. Both companies offer short, pleasant tours in the summer.